It was almost as if they knew it was moving day. Nearly 100 bright red, bigscale soldierfish splashed in their behind-the-scenes pool in the old North Pacific Aquarium, so energetic they threw water up and out of the net that covered their temporary home. But this day, was much more than that. It was moving day. Soldierfish are released into Baja Bay. On Tuesday, July 10, the time had come to transfer them from their temporary “growing up” home to their permanent digs in the 280,000-gallon Baja Bay habitat in the brand new Pacific Seas Aquarium, which opens to the public on Sept. 7. Foster, who has a bachelor’s degree in marine biology from Oregon State University, clearly loves caring for the fish in his charge. No-nonsense, he focused intently on the work, but was also tender while working with the soldierfish. The move was a carefully choreographed, three-hour blur. Foster quickly filled three large picnic coolers with saltwater from the soldierfish’s temporary quarters and inserted air hoses into them to oxygenate the water. Aquarist Melissa Bishop and aquarist Martie Johnson pitched in with various tasks. Then, it was time to begin moving the fish. And speed was of the essence. Foster carefully scooped the fish into a net about 10 at a time – not an easy task for swiftly moving animals with the large, red-edged scales and big dorsal fins. Each group received a three-minute bath in fresh water, the final treatment of several to ensure they were perfectly clean and free of any parasites or diseases that can bedevil fish populations. Then Foster scooped them up again and quickly walked out one room and into another, where the saltwater-filled coolers awaited the fish. Johnson held the cooler tops open as the transfer were made. Each time he left and entered the room where the soldierfish temporarily lived, Foster did a bit of a “quarantine two-step,” quickly putting one foot then the other into a disinfectant-filled sponge. 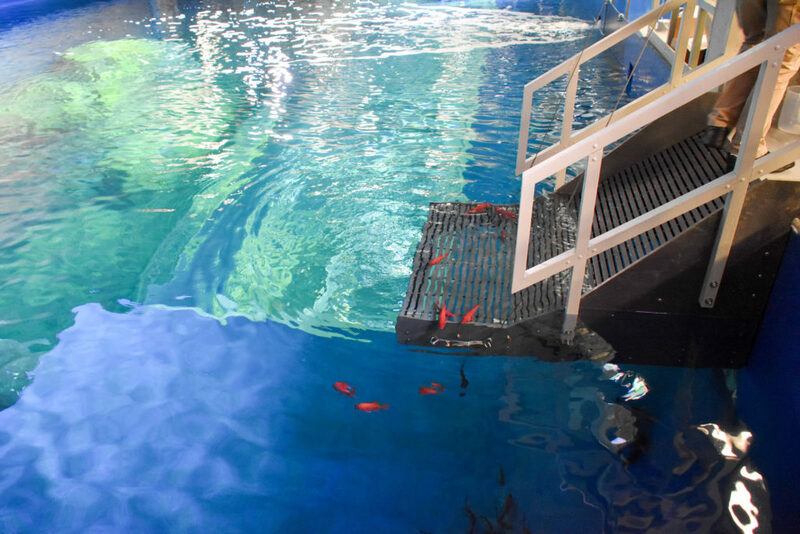 This “step” is crucial to not tracking bacteria from outside in – or inside out – during the series of water baths carefully constructed to ensure the health of the fish. The energetic, splashing, soldierfish – their colors flashing in the light – were the largest complement of fish to be moved yet, as the zoo’s team of aquarists – zookeepers who specialize in the care of aquatic animals – continues the massive job of moving thousands of fish and invertebrates into the Pacific Seas Aquarium. Once all were safely bathed in fresh water and then returned to saltwater in the coolers, the race was on. Foster grabbed the handles of the cart on which the coolers sat and walked swiftly out of the North Pacific Aquarium, across the zoo, down the path into the Pacific Seas Aquarium and up the elevator to the top of Baja Bay. There, the three aquarists put air hoses into the coolers to continue oxygen infusion into the water as Foster scooped water out of Baja Bay and carefully poured it into each cooler. The aim: gradually change out the water in the coolers to match the temperature and chemistry of the 77-degree Baja Bay. As he and Bishop scooped and emptied, scooped and emptied, Johnson constantly checked the temperature of the water in the coolers. They needed to get to 75 or better to release the fish. “We’re there!” Foster exclaimed. “Let’s release them!” His demeanor: professional with a touch of little-kid excitement. He grabbed a net and scooped up the gorgeous red fish, walking down short stairs to a dive platform where he knelt and smoothly set the net into the water, urging the fish to swim out and away. They complied. After several transfers, the task was complete. Ninety-three bigscale soldier fish were now at home in Baja Bay, where they were joined by 48 blueline snappers the next day. Over the next several weeks, an array of other sub-tropical fish, sea turtles Sunny and Azul, hammerhead sharks and spotted eagle rays will also enter their Baja Bay home.